After doing some research, I decided to give this a try and cut down on some of the weight through physical exercises. I hoped to gain social acceptance in the process. The learning curve was a tough one. But after a series of basic training, I started shedding the extra weight pound by pound. The Weider Pro 8500 is a strength training machine that allows you to perform a full body and intense workouts at the comfort of your house. This equipment is meant for those who wish to attain the desired body shape without paying monthly gym subscriptions fees. It is ideal for novices who would love to lose weight provided you are willing to cut on your calories intake. This gym equipment combines strength training and fat loss while at the same time preventing muscle loss. So, as you build muscle, you also lose weight. Featuring seven training sessions, this product can work out a variety of muscles. It is, therefore, indispensable if you would love to lose that weight troubling you. It works for the muscle groups in your legs, core, and arms, for that well-toned body figure. 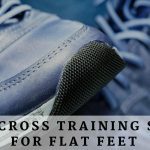 Measuring 84 inches in height, a width of 83 inches, and 110 inches in length, it’s a great home tool for those familiar with simple gym equipment. The weight cage is made of solid steel for extra rigidity. When fully assembled, it weighs 392 pounds and can take user weights of up to 300 pounds. If you have enough space in your home to accommodate such a size, then this multi-function gym equipment would be a great addition to you. The Weider pro 8500 has a steep learning curve. If you are a beginner, you must be prepared to put in serious effort to finally have the body shape of your dreams. An exercise guide is provided for novices and advanced users alike. There are no taking chances at times when exercising. And to better track your daily routines, the Weider Pro 8500 comes with an exercise chart. By using this, you can follow your progress, allowing you to set specific training targets. In this way, you minimize the likelihood of suffering an injury. Here is a video illustration on this product that I think might help you know more about it. The Weider Pro 8500 is a great home gym since it comes with several features that come in handy during your workouts. To help you understand how useful this home gym has been to me, here is a breakdown of all that it comes with. 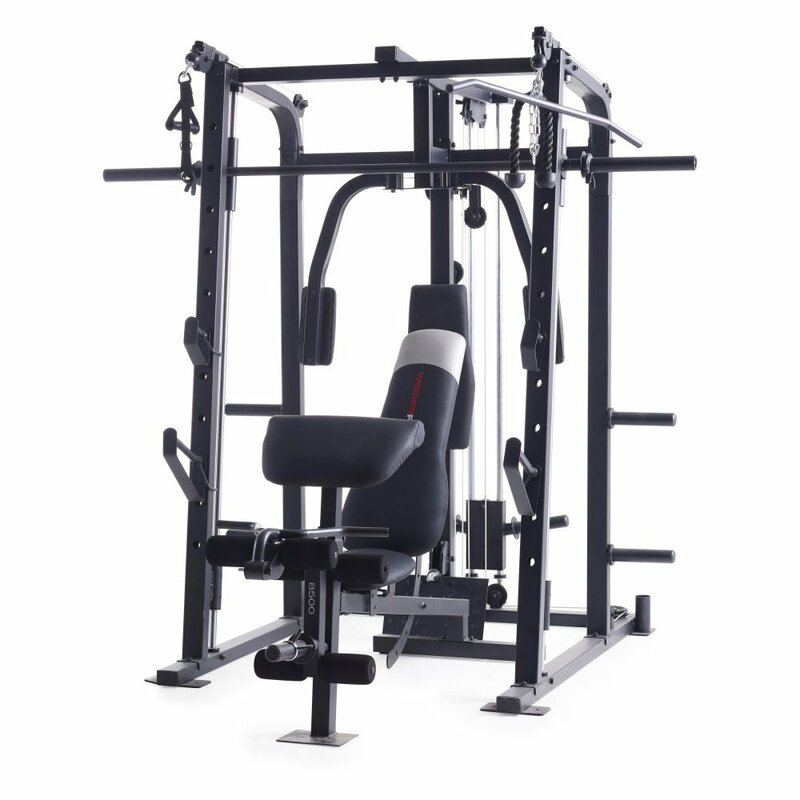 The Weider pro 8500 facilitates the performance of a wide variety of routines. These workout routines are ideal for your lower body and upper body strength or muscle building. For starters, it would be great if you start with lower body workouts such as back squats. You can then follow these with bench presses, bicep curls, leg extensions and a host of other upper body lifts. With the numerous varieties, start with something basic that you are most comfortable with, then crank things up a little at a time. This gym rack comes with a utility bench that is adjustable. This feature is great as you can perform the variable workouts I have just mentioned. Also, the bench can be reclined into various positions to facilitate the same exercise. With this bench, you can work numerous exercises like shoulder press, pulldowns, flat bench press, flys, and even prone rows. On the bench are preacher curls and leg extension/curl attachments. These are meant to give you a comprehensive workout. 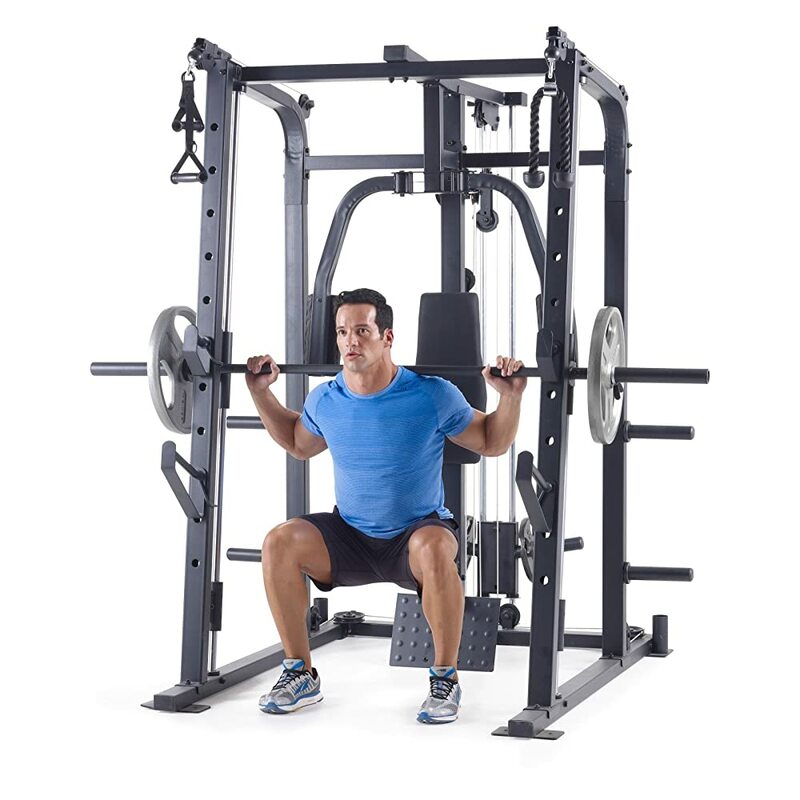 Another great feature is the 4 post squats rack which you would love if you are a fan of squats. However, a barbell is not provided, necessitating a separate purchase. If you ask me, I would advise you to buy one. It’s an accessory that I have come to appreciate on this equipment. Once you have a barbell, you can then enjoy the immense benefits of a 4 post squats rack. 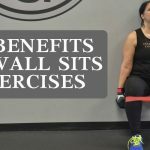 After that, you can do exercises such as back and front squats, barbell lunges, barbell split squats, barbell press when seated, bench press, and many more. The lower pins on this rack became useful someday when I was working out alone and had no one to help me spot the lift. What I did was lower the pins into a position that I could safely put back the barbell onto the safety bar. In this way, you don’t have to drop the barbell or find yourself in a position where you can’t do a proper lift. 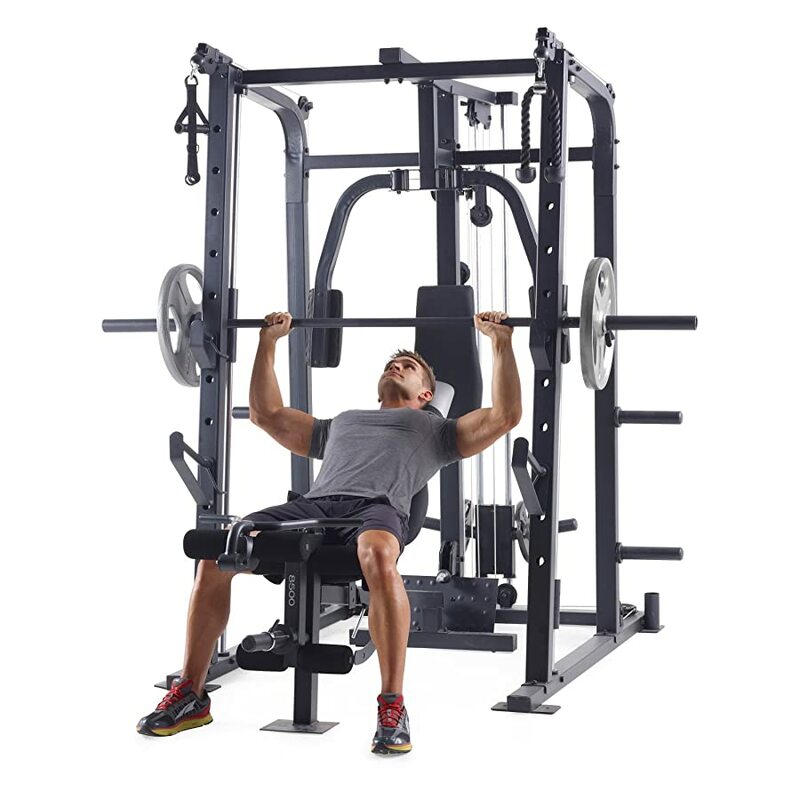 The Weider pro 8500 has butterfly arms which are excellent at optimizing a chest fly workout position. The arms are uniquely placed to provide for this optimization. In order to ensure your shoulder is always in a low-stress position, a pelvic fly is included in the design. This fly isolates your pectoral muscles to enable you to stay in a comfortable position. In return, you can perform chest work while at ease. Once you get used to this machine, you are going to have lots of weight plates. Unfortunately, storing these requires a lot of room. Storage is, therefore, key if you want to keep your gym area looking neat with plates readily available to choose from. I used to hate having to look for a set of plates then not finding them when changing between different sets. However, with the Weider Pro 8500, you have storage pins fitted on the rack so that you can conveniently and neatly stack your weight plates. If you have kids playing around the gym, make sure you stack the weights in order. Have the heaviest plates at the bottom to prevent any accidental toppling over of the whole structure. 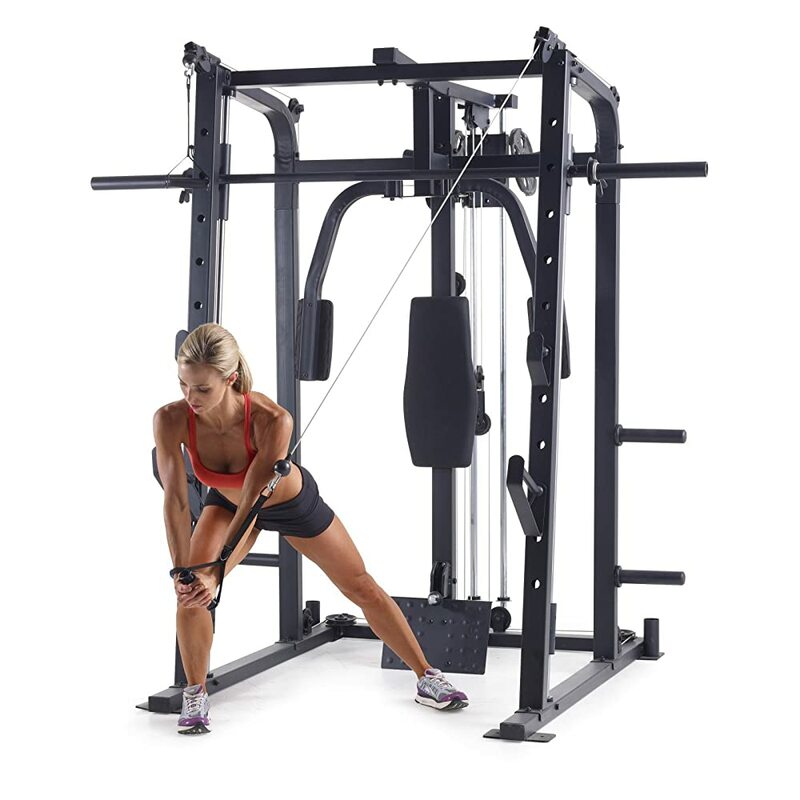 For your upper body strength training, this weight cage is fitted with a system of pulleys complete with cable attachments. These cable attachments can be bought from any dealer. Any standard one fits seamlessly with this machine. These pulley systems, two high-level pulley systems, and another low pulley are good features. This is because they allow you to perform various exercises through cable implements. The multi-purpose pulley system makes it possible to perform a plethora of exercises at the comfort of your home. Be it cable flys, straight arm pulldowns, single arm pulldowns, triceps pulldowns, ab crunches, face pulls, standing rows and more, it can be worked out. The versatility of the pulley system is one of the features that make this product great as an overall workout equipment. If you are concerned about the sturdiness of this equipment to withstand all that rigorous action, then you shouldn’t be. It features solid steel construction including the accompanying accessories. This material is great at ensuring a foolproof workout session. Regarding space requirements, the whole cage measures 84 inches in height, 83 inches wide, and 110 inches long. This length is inclusive of the bench provided. It has a total weight of 326 pounds. Therefore, before you make arrangements for purchasing one, ensure the room you intend on installing it in meets these specifications. And with all that weight and an apparent lack of rollers, once installed, moving this “bad boy” alone will not be a walk in the park. As with any bulky equipment, maintenance concerns are what worries many of you. That will never be the case with this equipment. First of all, it is the installation process that you will mostly find challenging. If you are on your own, then you will take a few hours to complete the whole installation. Once you have completed this first part, then the maintenance part will be a breeze for you. Routine and straightforward procedures are what this equipment needs. Periodical wiping of dust or sweat from the machine after a series of uses is what you will have to do. The few attachments and accessories are easy to manage too. Always be on the lookout for any loose parts after a while. Tighten any loose parts you find to ensure it is in proper working order. 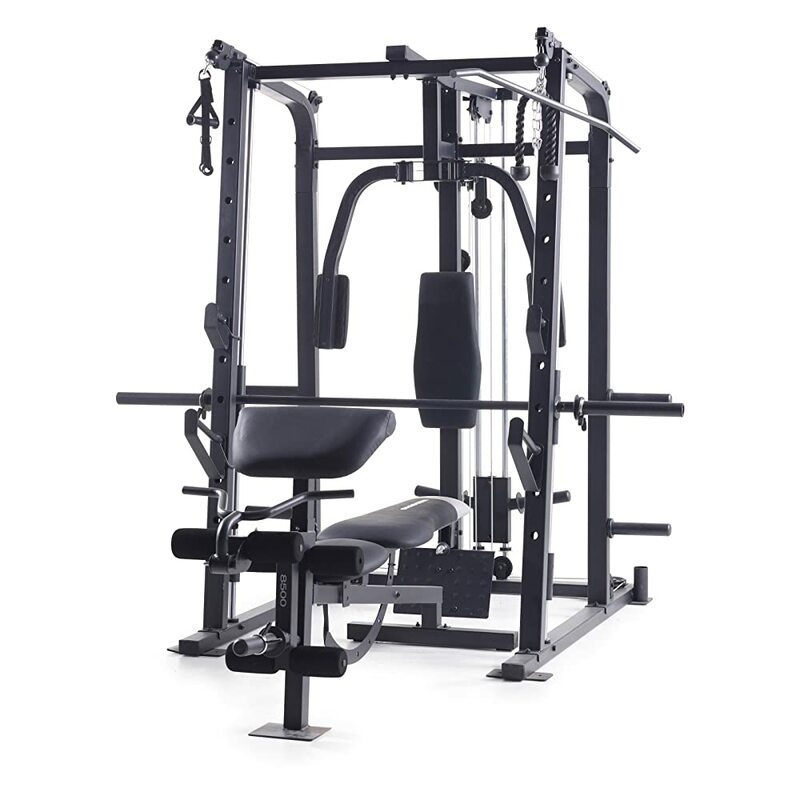 I have heard people say that the Weider Pro 8500 cannot replace an actual gym. Well, in a way, this is true, but not at all times. While a real gym might have more accessories and workout variants, this smith weight cage does fare competitively with them. Unlike a commercial gym where you are expected to pay monthly subscription fees, with this machine, you only pay the one-off purchase price. The rest remains free, and you will be having it in your own home for use when you want. Additionally, workouts have no preference for where they can be done. Whether it’s at home or in a commercial gym, it always doesn’t matter. What matters is the resistance provided by either a pulley system or a barbell. When exercising, you need to focus on your fitness and not on how comfortable you are. An array of features is available on this gym cage to make this possible. A rolled preacher pad eases the pressure felt by your knees during workouts. The 6-foam leg developer is also designed such that you can work out your buttocks and shape your legs without feeling any discomforts. What Do Users Say About the Smith Weight Cage? Most of those who have used this machine marvel at its impressive functionalities. For its price and the range of exercises that you can do on it, many users acknowledge the excellent value for the price. Although some users complain of the time-consuming assembly, it is a task they completed ultimately. This means that you can do it too. There are also complaints about the pulley system being rubbery, but this is rare. The Weider Pro 8500 Smith Cage is an excellent choice for your home workout station. If you are looking to strength training, lose weight, build muscle; hit it on a regular basis and then remember to eat healthy if you want to realize its immense benefits. When you do this, you will start to realize reduced body fat levels. You will then become fit as your muscle mass increases. It is designed with some accessories meant to make this a reality. Top-notch safety features are also included to give a safe way of training. Comfortable bench and preacher pad reduce fatigue levels. 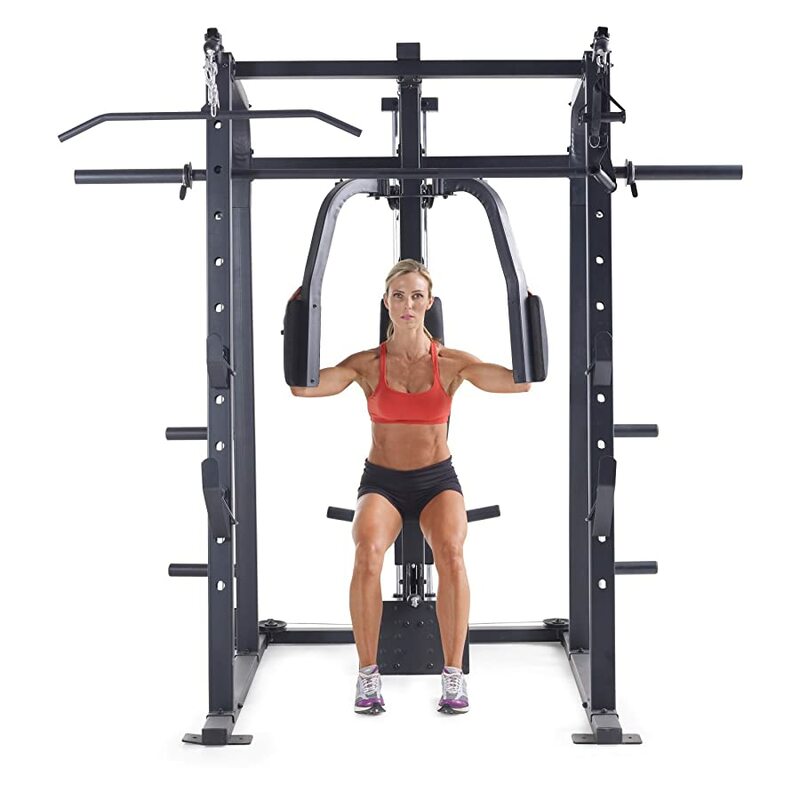 Overall, this machine gives your whole body a workout, from the lower to upper body. Although much could be done to ease the learning curve, the current features will do you just fine in my opinion. Click here to check out the Weider Pro 8500 Smith Weight Cage.